The Opticianry program at Ogeechee Technical College recently hosted a speaker from the Contact Lens Society of America (CLSA). 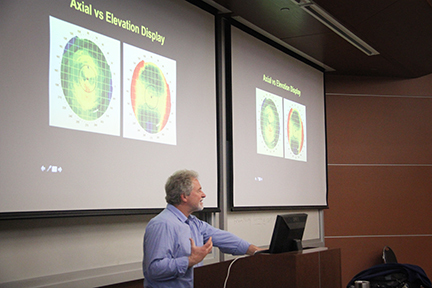 Buddy Russell, FCLSA, is a clinical instructor in Emory University’s Ophthalmic Technology Program and teaches contact lens technology to students and ophthalmology residents. Russell, who has more than thirty-five years of experience fitting contact lenses, is also an associate of the contact lens service at Emory University Eye Center. CLSA is dedicated to the education, evolution, and promotion of contact lens technology. CLSA strives to promote education, mutual understanding and cooperation among all persons interested in contact lens fitting.